“Troll Trump” aims to monetize the Republican candidate’s preferred mode of communication. A Google search for "Donald Trump offensive tweets" yields over a million results. 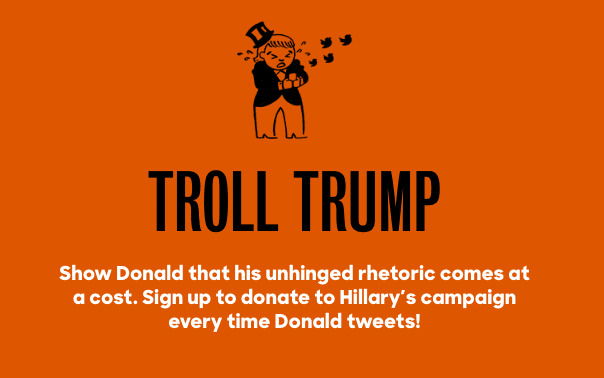 Aware of how prolific Trump is on Twitter, the Hillary Clinton campaign has debuted "Troll Trump," a new tool that allows supporters to sign up for automatic donations to the Democratic nominee every time Trump tweets. Ahead of tonight's third and final debate with Team Trump furiously tweeting during his performance, she could stand to make some not insignificant bank. Read "43 Artists On Why Donald Trump Is Bad For America" here.